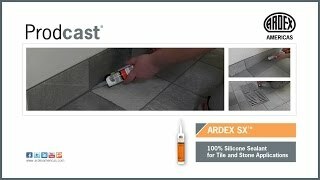 ARDEX SX™ is a one-component, non-sag, permanently flexible, 100% silicone, neutral-cure sealant for filling joints in tile and stone installations. ARDEX SX provides excellent adhesion, is easy to use, is available in 35 colors to match the full ARDEX grout line and is available in clear. ARDEX SX cures rapidly when exposed to atmospheric moisture, forming a durable, tight, stain-resistant bond. Colors: Please refer to the ARDEX Grout Color Chart, available at your local ARDEX distributor. Storage: Store in a cool, dry area. Do not leave package exposed to sun. Shelf Life: 1 year, if unopened.